Direct personal or family consumption as food, shelter, fuel, clothing, tools, or transportation, for the making and selling of handicraft articles out of nonedible by-products of fish and wildlife resources taken for personal or family consumption, and for the customary trade, barter, or sharing for personal or family consumption (AS 16.05.940). 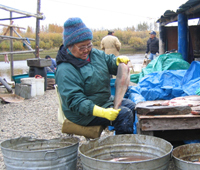 Under Alaska’s subsistence statute, the Alaska Board of Fisheries must identify fish stocks that support subsistence fisheries and, if there is a harvestable surplus of these stocks, adopt regulations that provide reasonable opportunities for these subsistence uses to take place. Whenever it is necessary to restrict harvests, subsistence fisheries have a preference over other uses of the stock (AS 16.05.258).